One person tries furiously cold calling businesses hoping for a sale. One person is going on endless numbers of meetings but closing no sales. One person is posting on Facebook hoping to drum up leads from a random acquaintance. It’s often a huge mess! There’s no fixed processes in place. There’s no way to accurately track any of the sales activity. If an investor were to look at this company and see that there’s no accurate way to predict revenue, they might just completely pass on the company. For example: If you want 4 new customers per month…how would you go about hitting that number? Many salespeople aren’t able to breakdown what it would take to hit their number, because they have no accurate data to go off of. However a company (and salespeople) with a proven process in place knows almost EXACTLY what needs to be done for the month to meet a certain goal. An accurate plan of what they need to do everyday. Peace of mind knowing they can hit their quotas reliably. That’s the power of having a predictable system in place. When I was 23 years old I was working in sales in Aliso Viejo California. It was my first job and I was cold calling VP’s of It and IT Directors of mid-market companies doing about $100 million to $500 million in revenue. I was making roughly 50 calls a day. Call 5: Talk for 45 seconds, hangup. Or I would just leave voicemails that were never returned. I went to college to become a telemarketer. I felt chained to my desk. Like there was a forcefield around my desk and I couldn’t leave. Every day I would arrive at work. Get a coffee, which was the highlight of my day, and try to do anything but make cold calls. There’s managers nearby so I can’t just surf the internet. It looks bad if you’re not on the phone. I was expected to ALWAYS be on a phone call. My only function in life was to generate leads and annoy people who didn’t want to talk to me. At that point in life I thought there had to be a better way. I made it my mission to become a great salesperson, but not just through cold calling. I wanted to close sales. I wanted to make a lot of money. I watched other salespeople cold call and it just seemed like a crapshoot. They didn’t test their calls. It wasn’t until I discovered cold emailing that everything changed. 15,000 A/B email tests later…. That’s when I came up with my 1 Lead A Day System, and its primary advantage was email. Cold Calling isn’t working as well as it used to. I find this to be a great thing for salespeople! And that’s because email has slowly crept up as being the number one form of communication in business. Sure slack is coming, but for day to day, you can reach anyone on email. Clearly I was making far more calls than sending emails. The reason is because using my method of cold emailing cut down on 95% of that initial cold-calling rejection. It’s not that cold calling doesn’t work, or can’t work, it’s just that it’s not an effective use of your time. I have nothing against cold calling, but the sheer amount of time it takes to make 100 cold calls in a day is staggering. Or what if you already have accounts, how likely are you to prospect for two or three hours between meetings. Cold calling is the first thing to go, even though you know you should do it. Over the last 7 years I’ve made it my goal to perfecting a cold email system that psychologically triggers certain responses from the recipient. …been used by 70,000+ businesses and entrepreneurs. …been tested at Fortune 500 companies like Microsoft, Apple, Facebook, Oracle. …been tested at smaller private companies and by individual entrepreneurs. …generated over $1.25 Billion in sales. For salespeople that start using this system, it means less frustration, less rejection and more reward. But the best part about emails is you can delegate it to someone else. You can sort-of do that with a cold call, but it comes out differently every time, and different people perform the sales script differently also. You can test the same email over and over. Whereas each call goes a little differently. You can send hundreds with one click. Whereas hundreds of calls takes forever, and are kind of depressing to make 8 hours per day. Email you can delegate to someone else so you can go play golf or pick your kids up at school. Everything is trackable. You can see what’s working and what’s not. Go by data, not just by sheer effort. With email you can track things on a scale never possible with calling. Which days are best to send his emails. Which email templates are working. Which email templates are NOT working. We can then modify his sales process to make it better. This is only possible because we can track every aspect of his email. Imagine going from zero sales process, to knowing every send and click that happens. If you are not using a step-by-step sales system with email at its core, then you are missing out on one of the most powerful and efficient sales tools of all time. One of the most common concerns people have is if the 1 Lead A Day system will it work for their specific industry or position. This is Carl. He’s based in Silicon Valley and runs a software startup. He and his team were new to selling businesses (in this case hospitals and medical practices) on their software product. They quickly learned that cold calling was hard, time-consuming, and flat-out demoralizing for the entire team. It just seemed like no one would even take the time to speak with them. It wasn’t until taking the advice taught in 1 Lead A Day that Carl’s team realized that cold emailing was going to be their primary sales channel. They setup the system and saw results within the first month, and are continuinge to grow today. What he changed: Implemented 1 Lead A Day System, especially less 13. After: 2x increase in first month. 4x increase by month 3. 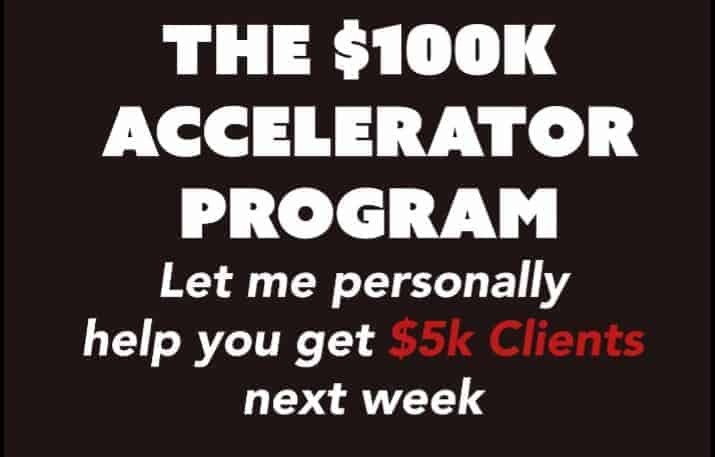 $100,000 by month 3. “When I first used this email it was like magic. I only put about 2 minutes of my own effort into writing the middle blurb for the email. Even after sending I did not expect it to work… But of the 12 companies I sent it to, I immediately got 6 responses. It was amazing. From $480k in sales, to $34 million in one year. This is Mark, and he’s an experienced sales guy. He started a new job and was expected to bring in sales. He immediately started using his well-established network from over the years and brought in sales. However, after the 2nd month on the job he was out of contacts, and the CEO of the company asked him, “Ok Mark….what’s next?” All Mark knew how to do was (begrudgingly) pick up the phone and start cold calling. Around this time he heard of Bryan’s cold emailing system and decided it was worth a shot. In 1 year he went from closing $480k in business, to $34 million in business. What he changed: Implemented 1 Lead A DayBreakthroughEmail, especially lesson 10. “In the course of 6 months I had 224 meetings: Vanguard, Bank of America, Allstate, the country of Aruba, Cayman Islands, American Airlines, Delta Airlines, Verizon Wireless, Target, Converse, North Face, AT&T, Verizon, Cisco. These are brands that in my previous 15 years would never talk to me.”Year 1 at the new job: Closed $480,000 in sales. Year 2 at the new job after implementing Bryan’s system: Closed $34,000,000 in sales. This is Justine. She started at a small publishing company in New York a year ago, and wasn’t sure exactly what she was doing. It was just random actions like calling or sending messages on LinkedIN trying to drum up sales. Before: Was sending out cold emails and getting around a 5% response. Meaning 95% of the emails she was sending weren’t getting responses. What she changed: Took Bryan’s training and totally re-thought the way she was approaching every target. She realized she was sending the same email to every person, and this was killing her results. After: Her new laser-targeted emails are getting 60%+ of people to respond and take her meeting. This is Paul, and he owns an enterprise IT staffing company. He fired a VP of Sales who he relied on to grow the business. When that person didn’t work out, they scrambled to find anyone to bring in sales. Depending on one person to make-or-break your company was stressful and puts you at risk of wasting a lot of time. It wasn’t until Paul implemented Bryan’s training that they predictably started to bring in meeting-after-meeting. Before: Hired a 15 year veteran in the industry, and was extremely disappointed in the results. The only thing the VP of Sales sold was himself…, on getting the job. After: Has since generated 70 to 80 meetings from the system and approaching 7 figures in sales. 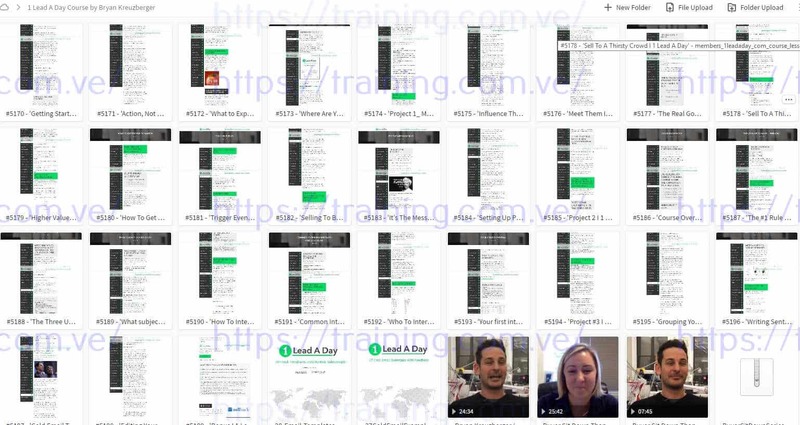 This is just a small sampling of the success we see with the 1 Lead A Day System, and shows that nearly anyone in their sales career can improve their sales with this system. From a newbie salesperson to an experienced veteran, it works. If you’re not happy with your current results (or you ARE happy, but just want to make more by doing less work), then applying 1 Lead A Day to your existing process is going to be well worth the investment. Omnicom is the 2nd largest advertising agency in the world. It has 74,000 employees in 100 countries, clients like Google, J&J, HTC, Nestle, Visa….and they have $15 Billion in revenue per year. He’s a buyer for Omnicom. When a salesperson tries to sell him on anything, he ignores 99% of the emails and calls he gets. Every week, Colin is literally the guy thousands of bushy-eyed and smiling salespeople try to reach, to try and persuade him to take their meeting. ….and anything else you can imagine like the Superintendents of a School District, even Principals. How are you going to get Colin and others like him to respond if he is flat-out rejects 99% of the people who contact him? In the 1 Lead A Day Insider Series we’ll show you the exclusive interviews that can help get you past the gatekeeper. Many companies try to grow larger by hiring a bunch of salespeople and then begin “throwing spaghetti at the wall” to see what sticks. If your strategy is to hire a bunch of people and then fire them within 6 months if they don’t produce, think about it…is that how the Yankees build a championship team? Is this how any team is built? Of course not. You need a process. A system. You need to win. You need that glue that keeps the team together and working hard to achieve their goal of being a consistent, predictable force day after day. They make salespeople cold call. They make salespeople randomly cold email. They wait 3-6 months to see which salespeople work out well then fire the rest. They notice only 1 salesperson is carrying the entire team, and then that person leaves. This is the sign of a non-predictable sales team that has no process and is completely at the mercy of a few superstars. Even if you are a superstar now, wouldn’t you like it to be easier to get meetings? The COMPANY doesn’t have a predictable sales process. Each person has a different style. Each person has a different process. Each person has a different set of strengths. Each person has a different set of weaknesses. If you want to learn from your mistakes this is great because it allows you to try multiple “experiments” to see what sticks. However you could save a lot of time just by following a predictable sales system. Doing things this way leaves the whole company unpredictable and in turmoil. One team member can leave, and the next person has to start from scratch using their own methods. You can’t predict how many meetings will be scheduled. You can’t predict how many sales will be closed. You can’t predict which salespeople will produce. There’s no way to get predictability out of a completely unpredictable system. This is where the 1 Lead A Day System steps in. It’s designed to take each sales person and get a predictable number out of them. Ben needs to generate one extra lead per day. He picks up the phone for 30 minutes and cold calls. He then sends out 10 emails to some people he thinks might be interested. He then sends out a LinkedIN requests to 30 people in a distributor group. Result: Completely unpredictable. Meetings are setup by pure luck. He has to reinvent re-invent the wheel for each client. No way to determine what worked and what didn’t. Jason needs to generate one extra lead per day. Jason already knows the exact target customers who are likely to be interested and buy. He uses email templates that have been proven to work hundreds of times to request a meeting. He wakes up the next morning with the email responses in his inbox and schedules meetings with those people. Result: 1-3 meetings scheduled per day. Jason knows how much time he needs to spend to generate those meetings. NOW…..imagine we scaled this operation up to 10 sales people. 10 X Ben = ? All up to luck and chance. No clue what results to expect. 10 X Jason = 250 meetings per month, 35 sales. We can pretty accurately calculate how many meetings and sales this team will get because it is following a predictable sales system. That’s the value of a predictable sales system. Doesn’t need to reinvent the wheel for each hire. Can predict revenue and sales far easier because there’s a predictable process to use. Has proven processes that you can use to scale your business. Helps you hit your number more often because the sales people know exactly what to do, to hit their goals. Gets each salesperson 1 extra qualified lead per day. Let us guide you on how to implement the 1 Lead A Day system for yourself (or your company) to make a sales system that’s far more predictable and enjoyable. Based on my situation, am I the right fit for this course? We are an employee benefits firm that administers employer’s benefits program and consults on health insurance and retirement plans? Will it work for me? Do you think you might have a course for folks selling products or services for a smaller priced market. I work with a company that sells credit card services to small and medium size businesses. I’m trying to figure out if this will help us generate leads for our technology business? PPC and telemarketing used to work, but now they are not as effective. Answer – First off if you are cold calling or your team is then yes our system is much more effective. To answer the larger question of is cold emailing the right fit for you I need you to answer the following questions below. Answer: This one is pretty simple. If you want to target businesses, then yes we can help. What do you sell them? Answer: There are three scenarios where we help salespeople, entrepreneurs and marketers find leads. 2. If you sell a consumer product or something less than $20,000, it’s more of a sales strategy and scaling question. Would you prefer to partner with a company and sell hundreds or thousands of customers? Or do you want to sell direct to each consumer. I prefer to partner. We recently partnered with 30 companies to reach 1.5 million of their customers, growing our database by ten’s of thousands. Now, If you aren’t sure about the most effective sales strategy for your business we cover sales strategy in the course too. 3. If you sell to smaller businesses, my theory is if you can write an email for a person at a medium size or large company then writing an email to a person at a small company is even easier. Fundamental human psychology is the same. Find out how Carl converted 125 different customers (to make $100,000). Bryan I’m still not sure if it’s the right fit for me? If you still aren’t sure and you have read the 25 Most Commonly asked Questions then email us. (1) Who you are trying to reach? (3) What’s your average sale size? We are different than the U.S. market, do you have proof that it work in my country or language? Do you have many testimonials of people selling into the Australian market? Answer – First off let’s assume you are contacting businesses. 1. The fundamental business environment in every country are all similar. Managers in France delegate to the people who report to them. Employees don’t want to get fired, and want to make for money. People have no time and are busier than ever. People all check their own email. 2.The psychology of humans is all the same. People are either moving towards something, or away from something. People buy for three reasons. (1) They desire something. (2) They fear something. (3) Or they are frustrated by something. I’ve found when selling to businesses my customers bought because they were frustrated by something. 3. In B2B sales, there are lots of people you can talk to but few people who can actually buy. Here are six leads to avoid: Ian the Influencer. Charles the Champion, RFP Richard. No Money Norma. Follow-up Phil. Proposal Pete. All of these people can say no to you. None of these people can say yes. Regardless of country, it’s always the same. 4. Finally, let’s talk about different countries and languages. This is a good question because it was something I struggled with when I started teaching the system in 2012. Actually the first person I taught the system to was in Switzerland, writing to someone in Belgium who spoke French. 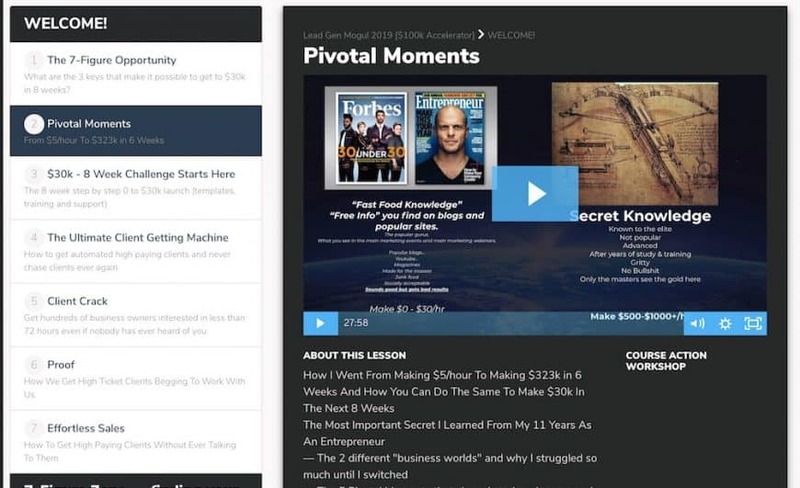 I share his emails and the process to think like your customers in the course. The system is designed to take this into account because the process is based off of your customers. You will interview your customers to understand the language they respond to and what got them to initially buy. So no matter where they are, if they are in the UK, India, or Bogata Columbia the whole process is based on your business and your customers. P.S. If you still aren’t sure and you have read the 25 Most Commonly asked Questions then email us. We’re so confident you’ll love the 1 Lead A Day training we’ll guarantee you’ll get a 100x return on your investment within 2 years. All you have to do is go through the system and show us your work. We can offer this because we’ve seen the results from so many salespeople and teams using this system, and it works. Now that’s a solid guarantee. When I started in sales I was young and didn’t care about time and comfort. Fast forward 15 years and there’s a wife & kids in the picture who I want to spend my time with. I quickly realized one of the most valuable things I have in life is TIME. Time to spend with my wife. Time to spend with my kids. Time to be around my family. This is exactly what 1 Lead A Day gets you back: Time. Make you more so you can do the things you and your family want in life. Save time so you can do more of the things you want. 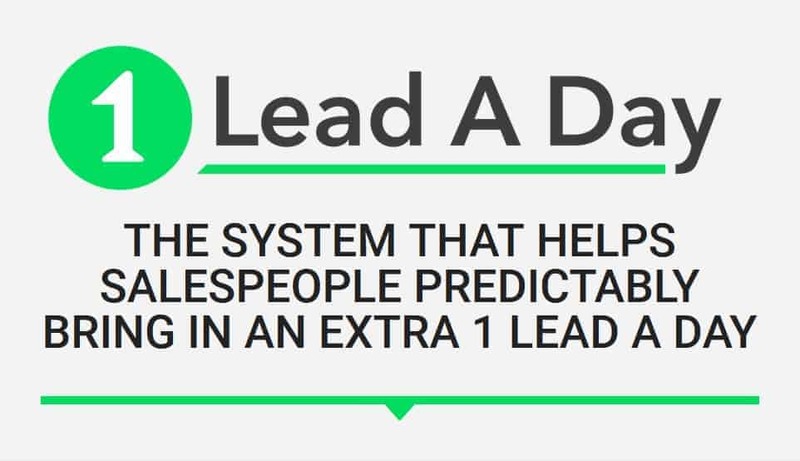 1 Lead A Day is a system that’s laid out step-by-step for you to implement in your sales so you can spend less time doing activities you don’t like, and more time closing sales, enjoying your work, and spending your time doing things you love. No sales in 3.5 month to 2 sales per week. I want to let you know that I got my first sale last week! And I got my second one yesterday. And I have at least 2 more that I should be closing this month. My boss didn’t give me any training for my job, and I’m the only sales guy in our little operation, so your program has been a lifesaver. -Produce my own leads (build my own list and cold emails). -Find out everything necessary to the to the “pain points” and create a winning solution. -Create and present the winning solution so well they have to buy from me. -Never get lost in the follow-up game because I always have a follow-up appointment set by the end of the call, with clearly defined next steps. Product: Minimum $5,000/month long-contract design services. Results: Went from booking zero clients in the first 3.5 months of working at the firm, so immediately closing 2 sales in the first 2 weeks after Bryan’s training. From average 1% response rate to over 10% response rate immediately. “I was skeptical that I could get the promised response rates. My previous cold email B2B attempts resulted in 1-3% email response rates. I was amazed that our response rate jumped to 10% almost immediately. Name: Richie Hecker – Chairman of Insparq (acquired). Product: eCommerce marketing for large retailers. Results: Went from a 1-3% response rate to over a 10% response rate almost immediately after implementing the system.